The playback dialog lets you determine some of the interpretation of your score while playing. Without legato switched on, all notes will be switched off before the next note starts. Disable audible ornamentation completely, play ornaments/embellishments using anticipation, chromatically/diatonically, slow , baroque or fixed timing. Play or ignore cue-size notes. Default accents will be on the first beat within a bar as well as first notes of every cluster, unless you specify 0 for First note within bar and First note within cluster. How loud or soft the effect of a dynamics marker will be is something you can define here. 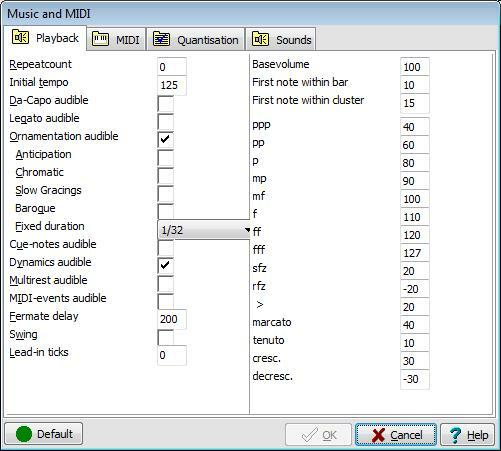 ppp to fff are the resulting MIDI-volumes (between 0 and 127) the remaining options are dynamic changes.